Your exterior signage gives your potential customers the first impression of your business. If you are in a niche where looks really matter such as a fashion house, beauty and cosmetics brand etc, it becomes more important to get your business signs designed the right way with an appealing look as they would play a key role in branding. With a well-designed retail signage, you can increase brand awareness, create a higher perceived value of your products and encourage passersby to just step into your store to explore and hopefully even make some purchases. This time, Citrus Sign Studio did just that for Alta Moda. Alta Moda is an upscale fashion brand that features the very latest in resort wear for men, women and children. 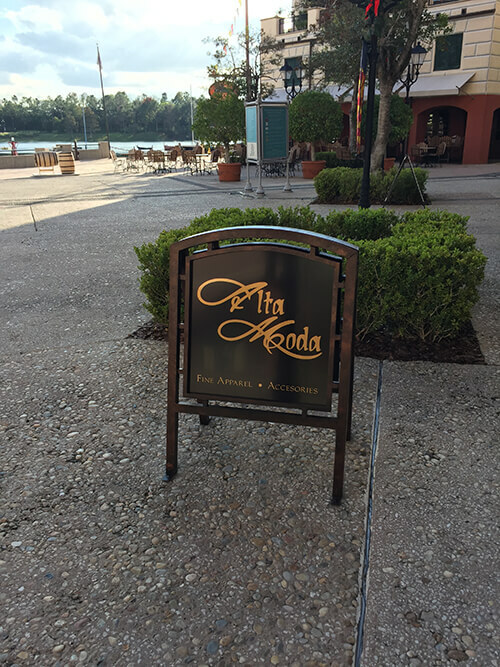 Thanks to its presence in the luxurious Lowes Portofino Hotel & Resort at Universal Orlando, Alta Moda attracts many people looking for that perfect resort wear they have been unable to find until now. From fine Italian fashion brands to accessories that make your final outfit get a class of its own, or from swimwear to that dazzling evening wear, Alta Moda can deliver it all to make those wearing it the cynosure of all eyes. In keeping up with its fashionable image of all things classy, our esteemed client needed a makeover of its existing exterior signage. The Lowes Portofino Bay Hotel recreates the romance and charm of Italy’s popular seaside village of Portofino right down to the outdoor cafés and cobbled streets. Thus, the outdoor signs for business should ideally be in tune with the surroundings and depict the epitome of luxury and elegance that this hotel showcases. 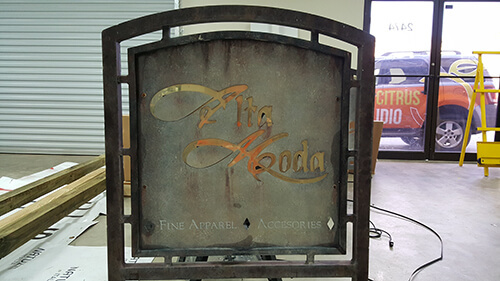 At Citrus Sign Studio, we believed this should hold true for Alta Moda as well. 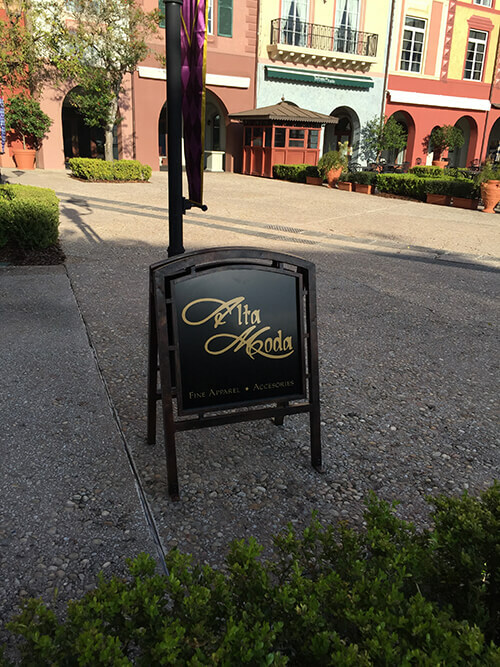 The earlier retail signage of Alta Moda in the Portofino Harbor Piazza had the alphabet colored in gold placed against a gray background. Despite the formal font Alta and Moda and the rest of the word strongly etched, the exterior signage wasn’t bright enough to attract the attention of onlookers. So, at Citrus Sign Studio, we gave it a new lease on life with new graphics and materials that were in tune with this leading fashion store’s brand image and created a significant impact on those who glanced at it. Having served businesses across various industries for long, we know outdoor signs for business have just a fraction of seconds to attract the attention of people and encourage them to proceed to the store. So, our makeover plans aimed to make the sign as appealing and attractive as possible without tampering with the basic pattern. We made the name in gold stand out against a black backdrop, which in turn was encased in the dark mahogany colored stand. With the use of new custom artist paint, we made sure the new exterior signage for Alta Moda matched the theme and setting of Lowes Portofino that celebrates la dolce vita – the good life.